We’re starting a new book for the reading group on Monday, May 8. It’s called Astrology & Relationships by David Pond. I have a copy of it, so there’s no need to buy it unless you want to go above and beyond our sessions (which I recomend) you can get it at abebooks for under 15 bucks. This is a REALLY, REALLY great chance to find out about your astrological make up, as I’ll be printing people’s charts so that we can directly relate the reading to our own make up. In order to do this I’ll need all of your birth info: year, date, location and time (must be exact) Feel free to bring your partners birth info (with their consent!). 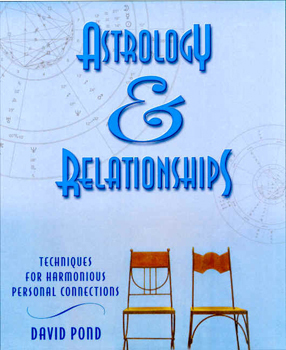 Synopsis: Most of what is published about astrological relationships covers the same ground. We’ve all read that Libra gets along well with Leo, Aries is bound to clash with Capricorn, Pisces and Scorpio are natural lovers, and so on. It all sounds like a pretty well-worn formula, but there’s one problem–people are not that simple, and neither are relationships! Astrology and Relationships takes a much more satisfying path, showing you how astrology can help you improve all of your relationships. It addresses the complexities of real relationships by revealing the essential nature, needs, strengths, and challenges of every combination. Then it takes the unique step of offering exercises that will help you manifest the true potential that exists between each of the signs. oh gwell. I like this book, it could go into some of the other proberties of the signs a little more but its really good for understanding how to have better relationships of all kinds.